Bitcoin: What, Why, and Who Cares? Stewart Foley, Lecturer in Finance at Lake Forest College, opened his presentation by asking, "How many in the room are using Bitcoin?" No one raised their hand, making us the perfect audience for his presentation on what Bitcoin is, why it exists ... and why hardly anyone's using it. 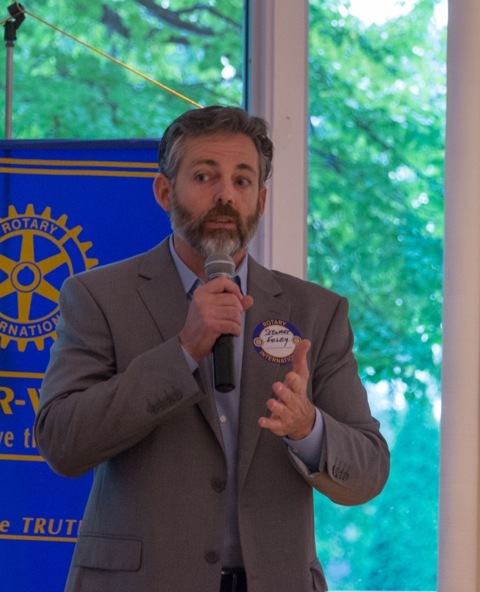 Mr. Foley explained that Bitcoin is an alternative to government-controlled currency. Such an alternative may be appealing because it can't be manipulated by a government the way a fiat currency can be (a fiat currency being one that has value because "the government says so" instead of being tied to the price of gold or some other commodity). In 1971 US currency was decoupled from gold, so the government can print more money as needed, said Mr. Foley. He showed statistics indicating that, as more dollars are produced, consumers' purchasing power declines; he said this decline has been at a rate of 4% to 8% per year. The real issue is inflation, he said. Keeping reported rates of inflation low gives an impression of economic prosperity and controls cost-of-living adjustments and debt cost. Inflation is calculated by substitution, Mr. Foley explained. Even though purchasing power has declined, if consumers compensate by buying lower-quality and/or lower-priced equivalent products, it's not counted as inflation. One example of this is changing package sizes and charging the same price. Consumers are still getting the product, just less of it. Bitcoin is a virtual currency system in which people trade real goods for virtual dollars. One can purchase bitcoins (using regular currency) or "mine" it through an exceedingly complex mathematical computation that most users will not be able to comprehend. A finite number of bitcoins will be able to be mined, rendering the system immune from devaluation by flooding the market. Because of the system's extreme complexity, and the fact that it can readily be used for international money laundering, Bitcoin is unlikely to gain widespread popularity.